Chiki Sarkar decided not to run her family-run media business and made her mark in publishing. It's important to find your own place in the world," says Chiki Sarkar, the 37-year-old Publisher of Penguin Random House (PRH) in India. The daughter of Aveek Sarkar, the promoter of the media group ABP, she believes it was 'extremely' important for her to carve out a career independent of her father's business. Sarkar already has plenty of feathers in her cap. She was educated at Oxford University after finishing her schooling in Kolkata and worked at London's Bloomsbury Publishing for seven years. 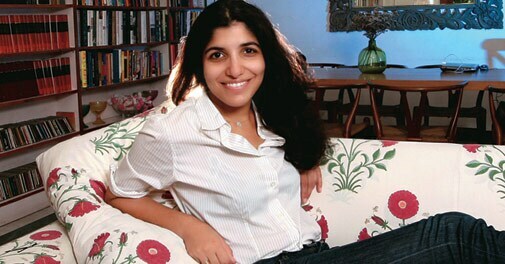 In 2006, she returned to India and joined Random House India in Delhi as its first editor-in-chief. She moved to Penguin Books India in 2011, as its publisher. Penguin Random House (PRH), the largest trade publisher globally, came into being in July 2013 with the merger of Penguin Books and Random House. Sarkar took charge of PRH India from April 2014. Sarkar was instrumental in publishing the works of several celebrated writers, including Amitav Ghosh, Arundhati Roy, Vikram Seth, Suketu Mehta and Vikram Chandra. But Sarkar thinks it is still too early to call herself successful. "I don't see myself as successful or unsuccessful. I think of myself as someone who either did her job well or didn't". Sarkar, who began her career in London, says there is a big difference between the publishing industry in India and the UK. Indian editors aren't dependent on agents to find books, she points out. "So we are always generating book ideas inhouse, approaching people, and sniffing around for new books. The publishing culture in India as a result is much more risk and ideas-oriented," says Sarkar. However, the Indian publishing industry is not highly profitable and most business models are predicated on average sales of 2,000 to 3,000 copies. "It is not the best model and starting next year, we're actively trying to change that but it will be a challenge". Sarkar says her core job has remained the same over the years. "I am an editor who finds, edits and publishes books and promotes the writers I believe in. I commission and look after 20 books a year just as my other editors do". Sarkar looks back at the last year with a sense of satisfaction. "We did a number of great books, including Sanjaya Baru's The Accidental Prime Minister and Devdutt Pattanaik's Sita". These days she is busy editing a book on the Aarushi murder case and is also putting final touches on the publicity campaign for Naseeruddin Shah's memoir. Urvashi Butalia, publisher of Zubaan Books, says that Sarkar is a bright, intelligent and competent businesswoman who has moved up the ladder fast in her profession. "She makes a good choice of books. It is a sound combination of books that have a mass appeal and those that are literary in nature."